With Etrian Odyssey X set to release next week for Nintendo 3DS in Japan, Atlus has posted a mysterious new teaser regarding the future of the Etrian Odyssey series. Etrian Odyssey X was already stated to be the last game in the series on Nintendo 3DS, so this video teases the franchises step into 'the next stage'. Etrian Odyssey X will at last be the 10th entry in the Etrian Odyssey series. The reason we have been able to continue the series is thanks to all of the fans who have played and supported its titles thus far. Thank you so much. 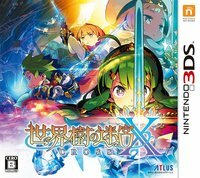 As we said at the start, Etrian Odyssey X is a culmination of the Etrian Odyssey series thus far, as well as the last Etrian Odyssey game for 3DS. But of course, that means the last “for 3DS.” The last title for 3DS is nothing other than an announcement for the beginning of the next stage. We are now moving quickly toward a completely new world for the Etrian Odyssey series that everyone has supported thus far. We are working hard to realize this passion as quickly and properly as possible, so please continue to give us your support.